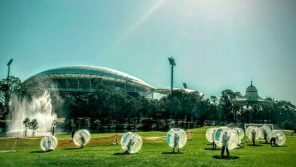 Bubble Soccer | Bubble Sports Australia | Get ready to Bounce! ARE YOU READY FOR BUBBLE SOCCER? Welcome to Bubble Sports, your premium all-in-one family fun zone! 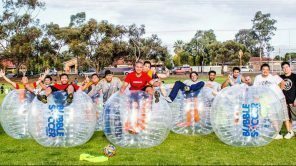 We offer the most Bubble Soccer fun for your dollar and our exclusive bubble sports events are designed to promote fitness, team work and laughter. How can bubble sports activities achieve that? Simple; when you wear one of our patented bubble suits, you are surrounded by an inflatable device that allows you to run, bounce, roll and spin, all while bumping into other bubbles. It’s a good physical workout, it makes you feel great and, most of all, it’s a lot of fun! Bubble Soccer can be played indoors on a basketball court size space. We have our own dedicated Indoor Arena in Melbourne, the first of it’s kind in Australia! You can also play at your local sports complex. There’s no official minimum age to play bubble soccer. However, due to the size of our smallest bubbles, we advise that players should be 90cm or over. A parent or guardian must sign the waiver for their minor(s) under the age of 18. 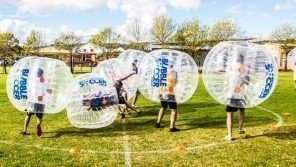 You can play Bubble Soccer at your local park, gym, oval, home or work venue (indoors and outdoors) to name a few potential locations. To protect yourself from knocks to your knees we recommend playing on grass. For private events and parties, each location has a minimum bubble requirement. Check out your closest for more details. There aren’t many weather conditions that will stop a game or Bubble Soccer so be dressed appropriately. We recommend closed trainers to protect your toes and remove all loose items – this includes glasses if possible. If it rains a light weatherproof jacket or alternatively a change of clothes and a towel. When the sun is shining you get pretty hot so suncream is essential. Some of our locations will run an event for an hour, however we recommend two hours to allow yourself time to take a break and watch the fun. Bubble soccer is a brilliant spectator sport so we generally recommend you have a few more people than bubbles to take the video footage! If you’re visiting one of our warehouse locations you can stay for as long as you like!